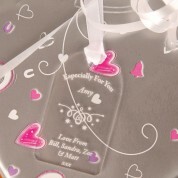 This acrylic gift tag is a lovely way to present a gift to a loved one. 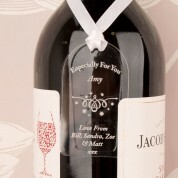 It has 'Especially For You' engraved at the top and can be personalised with the name and special message of your choice underneath. The unique swirl and star design makes it almost more noticeable that the gift itself! After the present has been unwrapped, it will look lovely hanging in their home. Dimensions: approx 3.5cm x 6cm x 3mm thick.